We understand that not all industries have a defined end time for their shifts, but they still might need a way to estimate labor costs. 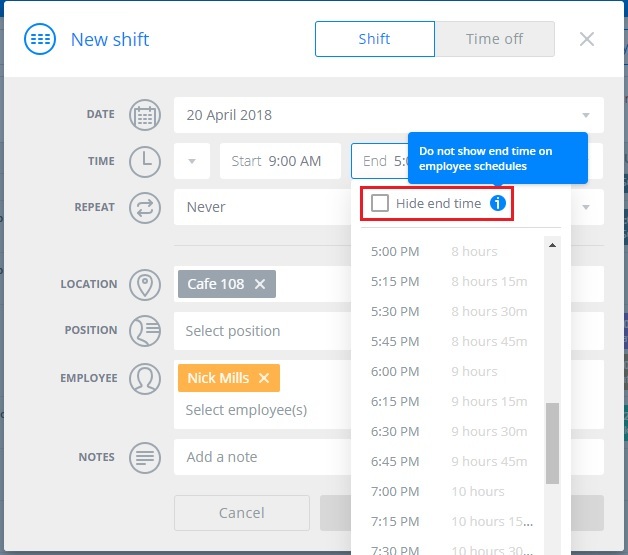 Sling has a feature that allows you to hide the end time of a shift so employees won't have any expectation that they will be done at a specific time. This means you can estimate that an employee may work a certain duration (8 hours, for example), but they will not see an end time or shift duration from their view. To hide the end time, click in the End field within the shift details and check the option that says Hide end time. This will create a shift that shows the start and end times for the admins and managers, while it will appear in the employees' view without an end time. Hidden end times can also be applied to time blocks to make using this feature easier.